What started as a bit of a recce ended up with climbing on the outside of the building 30ft in the air and finally visiting one of the places I have had on my list for a long while, and in enough time to see it before the entire roof was pulled down. Ghost stations are always a win! Opened on 8 August 1910 by the London & North Western Railway, Manchester Mayfield was built alongside Manchester London Road station (later Piccadilly) to handle the increased number of trains and passengers following the opening of the Styal Line in 1909. It was connected to London Road via a high-level footbridge. It was mainly used by suburban services to the south of Manchester, but a number of main line services used it during busy periods. Mayfield suffered the effects of bombing during World War II, when it was hit by a land mine (parachute mine). 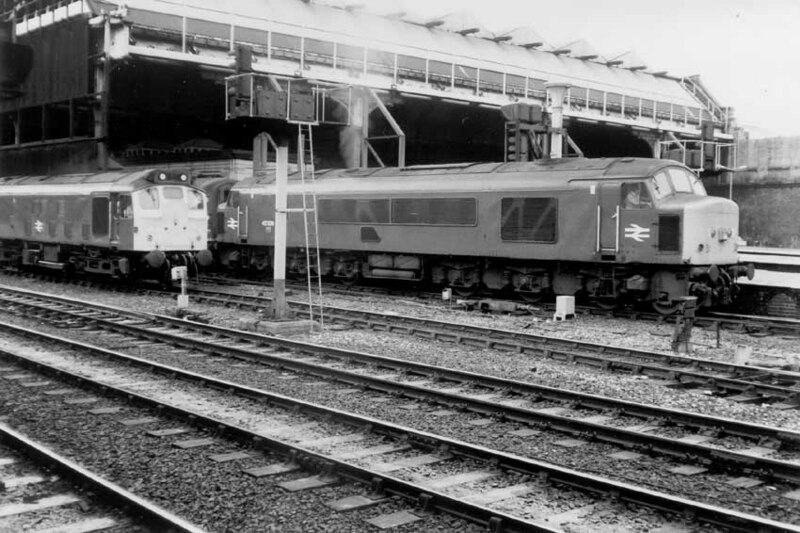 It came into its own for a brief period during the electrification and modernisation of what was to become Piccadilly Station in the late 1950s, when many services were diverted to it after a restoration of sorts. It was closed to passengers on 28 August 1960. The site was converted into a parcels depot which opened on 6 July 1970. 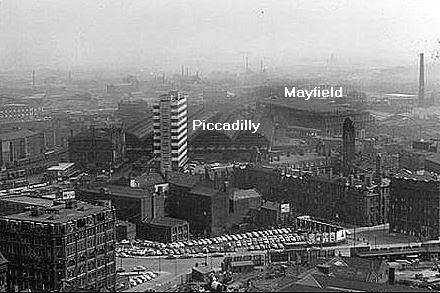 Royal Mail constructed a sorting office on the opposite side of the main line and connected it to Mayfield with an overhead conveyor bridge which crosses the throat of Piccadilly Station. The depot closed in 1986 following the decision by Parcelforce, Royal Mail’s parcels division, to abandon rail transport in favour of road haulage. The building has remained disused ever since, with the tracks into Mayfield removed in 1989 as part of the remodelling of the Piccadilly Station layout. The sorting office was briefly reused as an indoor karting track, but has now been rebuilt as prestige offices; the parcel conveyor bridge was removed in 2003. The site is currently owned by BRB Residuary. 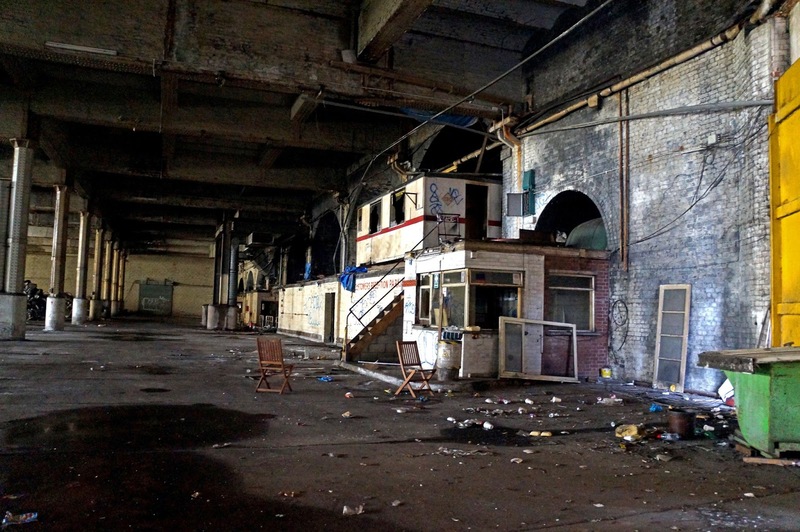 The interior of the station was used in Prime Suspect as a drug dealer’s haunt. 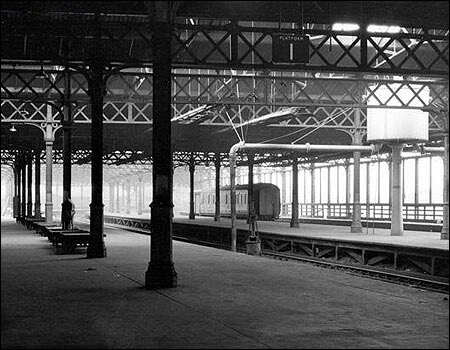 It was also used as a double for Sheffield railway station in The Last Train. 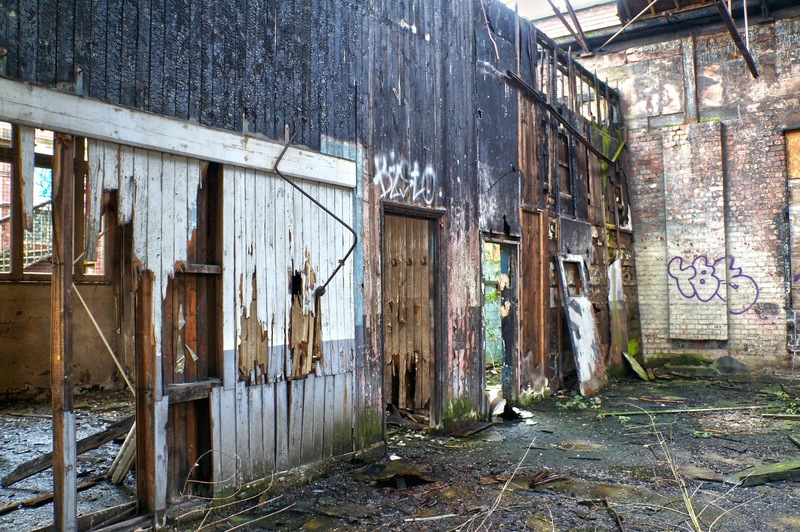 The roadside building was gutted by a fire in 2005. We have been asking Ojay about this place for a while but he didn’t seem at all keen on a visit, maybe after breaking his leg badly here he couldn’t face it again. We had no leads on how to get in and I had been told it wasn’t the easiest. We didn’t really expect to get in first time but in fact a little poking around the back and we found a way in through the depot which also involved getting past the obstruction above via some 30ft high external climbing! 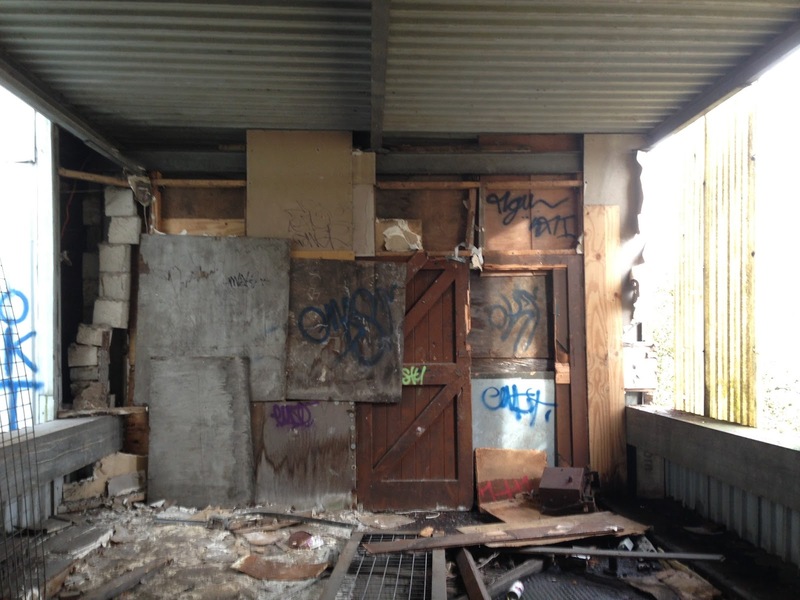 We had heard the station was being partially dismantled due to the Manchester International Festival using the depot as a venue so we were keen to have a look before too much of it had gone. The depot itself is quite open but not really too much to see down here. There was evidence of a clean up in progress but it was also still in quite bad shape with some very creepy port-a-cabins over in the far corner. Coming a little unprepared without head torches we had a bit of a peak in but decided to head up the ramp to the main station. If we are honest walking up here we didn’t know what to expect, if it was even the right way or if there was any access. It was one of those explores where you seem to just make a bit of progress here and there and decide to just push on and see what you find. After scaling the outside of the walkway we felt we were getting closer to something. I imagine this area is pretty secure now after having concerts in here, but I would be intrigued to see what they have done, as you can see the walkway was blocked off in a rather haphazard manner before! Finally after leaving the walkway and climbing over a suspicious looking roof we made it on to the station. After the intense decay smell of below, the dark and creepy tunnel this place was wide open and in the bright sunshine. It felt very different to other places I have explored being so open like this, you could see the trains coming in and out of Piccadilly so we had to be a little wary of how far along the platform we wandered. Although they have started to rip down that amazing roof there is still enough here to be a great explore, the originally 1910 buffers are enough just in them selves. This place is a little worn to say the least but it is great to see a part of the city most don’t even know exists and I hope that the future of this site is restoration and not the demolition which has been spoken about in the past. There is also apparently a downstairs section of the station too but without torches we decided to stick to the platform level. Bookmark this article Mayfield Station/ Depot… URBEX.